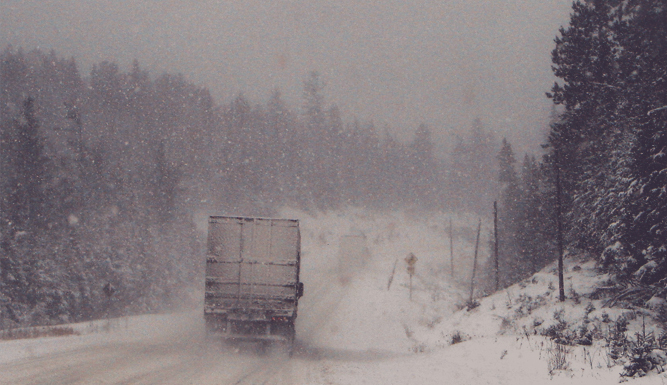 Winter presents more hazards for drivers and more headaches for fleet managers. Simplify your workload by following a few easy steps to winterizing the fleet yourself for the cold months ahead. First thing is to check your manufacturers maintenance schedule and conditions for winter or cold weather use. Ultimately, the manufacturer must abide by the terms and conditions if a warranty issue arises. Do a walk-around of the vehicle. Inspect and measure tire wear and overall condition. In cold weather conditions, snow and ice require extra traction. If the tires warrant replacement, now’s the time to get that accomplished. With recaps, extreme temperature conditions can cause the cap to separate from the casing. Also, take a look at the mud flaps for proper wear, length, and installation. Checking all lights for operation and brakes and hydraulic and/or air systems for leaks is important as well. Lastly, inspect the windshield for cracks and chips. Cold temperatures can expand a small imperfection into a major replacement, unless it’s caught early and repair for pennies compared to the cost of replacement glass. Now its time to go under the hood. Test the battery(ies) for the cold cranking amps remaining. This is an indicator of the reliability of the battery when temps drop and starting is crucial. Checking the radiator coolant for specific gravity is a must do. By doing so, the cooling system can work effectively without robbing the engine of horsepower if it begins to overheat. Be certain to clear all debris from the front of the radiator like bugs, mud, and snow. In cold climates, check with the truck manufacturer if it’s recommended to install a radiator cover that will block the oncoming air from circulating directly onto the radiator surface. Be certain to inspect the belts and hoses. Look for cracks, swelling, and of course minor leaks. All a sure sign of expensive repairs to follow if not addressed in the shop rather than on the road. With the engine warm, check the use of the climate controls in the cab. After all, without a comfortable driver you could be facing more downtime. While doing so, test the cab for the presence of deadly carbon monoxide. A battery operated carbon monoxide detector from a hardware store can identify if your vehicle leaks too much of the deadly colorless, odorless gas into the cab, especially while idling for long periods of time. Check your diesel’s emission fluid (DEF) system. DEF is designed to assist the emissions of your diesel engine in producing less harmful pollutants but the drawback is that the freezing point is 12F (-11C). Most manufacturers have designed their systems to heat the DEF and allow the engine to operate up to 45 minutes when the temperature is below the DEF freezing point. Again, check with the manufacturer to determine the best solution for keeping your truck’s DEF system operational. Invest in an engine heating system. Basically, diesels benefit from warm motors, making starting easy and less likely to cause damage on start up. There are two major systems available today. Most manufacturers use oil warmers, which keep the engine oil viscosity to a fluid point and making the start up process easier on the motor. The second most popular are coolant warmers, which keep the engine block, and all components associated with the cooling system warm. Either way, the end game is to make starting easier and less likely to cause damage on start up. Test your diesel engine’s glow plug operation. Simply follow the manufacturer’s directions on how to properly start the engine in cold temperatures. These systems work with the available battery power prior to starting. When using diesel in cold conditions, most retailers change over to Grade 1 in those locals. However, for OTR drivers, who drive in differing climates, make certain to use Grade 1 diesel when temperatures drop below 10 degrees F (-12C). Remind yourself to drain the water filter during fill up, which will help prevent freezing of the system as well.